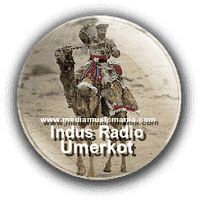 FM Radio Umerkot 95.4, this FM Radio is presently working in Umerkot City Sindh and providing best information and quality programs for the peoples of Sindh. FM Indus Radio Umerkot Sindh is very popular FM Radio Station under licensed from Pakistan Electronic Media Regulatory Authority PEMRA. This FM Radio service covered Urban and rural Areas in all areas of District Umerkot and Samaro with best quality sound. This FM Radio Service is wast area service with Kunri, Chore cantonment, Khokhrapar, Mirpurkhas, Mithi, Cachro town, Islamkot town and other jurisdictions of Tharparkar Sindh, and we can also listen the service of this FM Radio in the jurisdiction of Badin District. This FM Radio with love and affections and also this Broadcasting service you can listen others jurisdictions of Sindh. Umerkot is 60 Kilometer away from Mirpur Khas City, and the location of this Radio in Umerkot Therparker Sindh. This FM Radio provide best whereabouts of local areas, like FM Radio 91 Ghotki and FM Radio Tando Muhammad Khan you can listen news in local Sindhi Language. The Census of 1998 Report reveals that FM Radio Umerkot is the only medium and source of information for most of Rural and part of Urban areas. This FM Radio is providing best quality service to far flung areas of Sindh.